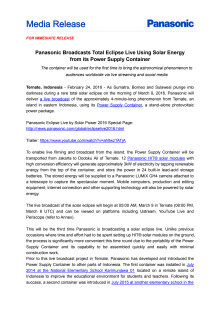 Ternate, Indonesia - February 24, 2016 - As Sumatra, Borneo and Sulawesi plunge into darkness during a rare total solar eclipse on the morning of March 9, 2016, Panasonic will deliver a live broadcast of the approximately 4-minute-long phenomenon from Ternate, an island in eastern Indonesia, using its Power Supply Container, a stand-alone photovoltaic power package. To enable live filming and broadcast from the island, the Power Supply Container will be transported from Jakarta to Dodoku Ali of Ternate. 12 Panasonic HIT® solar modules with high conversion efficiency will generate approximately 3kW of electricity by tapping renewable energy from the top of the container, and store the power in 24 built-in lead-acid storage batteries. The stored energy will be supplied to a Panasonic LUMIX GH4 camera attached to a telescope to capture the spectacular moment. Mobile computers, production and editing equipment, internet connection and other supporting technology will also be powered by solar energy. The live broadcast of the solar eclipse will begin at 05:00 AM, March 9 in Ternate (08:00 PM, March 8 UTC) and can be viewed on platforms including Ustream, YouTube Live and Periscope (refer to Annex). 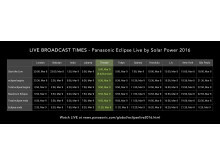 This will be the third time Panasonic is broadcasting a solar eclipse live. Unlike previous occasions where time and effort had to be spent setting up HIT® solar modules on the ground, the process is significantly more convenient this time round due to the portability of the Power Supply Container and its capability to be assembled quickly and easily with minimal construction work. 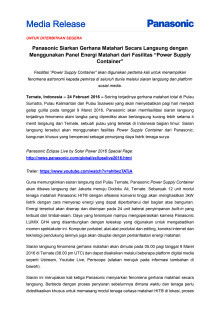 Prior to this live broadcast project in Ternate, Panasonic has developed and introduced the Power Supply Container to other parts of Indonesia. The first container was installed in July 2014 at the National Elementary School Karimunjawa 01 located on a remote island of Indonesia to improve the educational environment for students and teachers. Following its success, a second container was introduced in July 2015 at another elementary school in the mountainous region of West Java Province to enhance both study and water supply conditions. * The live will be also available to view at Ustream, YouTube Live and Periscope. * The broadcasting platform may be changed without prior notice by the internet connection status. * HIT is a registered trademark and an original technology of the Panasonic Group. The container was designed and developed for mass production to assure stable power supply in areas with limited access to electricity. PT. Panasonic Gobel ES Manufacturing Indonesia manufactures the Power Supply Containers and exercises quality management. The company will continue working with its counterparts in Japan to ensure consistent Japan quality solutions and make the containers price competitive for the local market. The container is designed to require minimal construction work onsite and can be added to existing ones at any time to generate more power. This allows general electrical contractors to install the Power Supply Container easily and quickly, helping to promote widespread use of the system on the various islands of Indonesia. 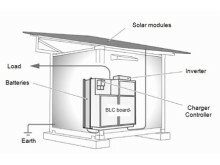 Additional equipment and devices such as water pumps can be connected to the container to enhance its functionality as a power generation system. Also, as the system is in container form, it can be easily transported from place to place if necessary. 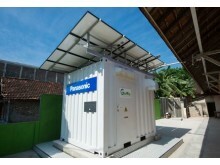 The container uses Panasonic HIT® solar modules to provide power efficiently, even in restricted spaces. The company's newly developed Power Supply Control Unit functions as the energy management system to monitor electricity level of the lead-acid batteries and control supply and demand, reducing deterioration of the batteries. This reduces the life-cycle cost and maintenance man-hours of the storage batteries. 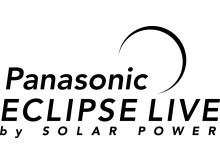 Panasonic Eclipse Live by Solar Power was first introduced in 2012 to highlight the dynamic technologies and products behind the company’s “Total Energy Solution” business. All electricity required to power devices for the broadcast, including video cameras, filming equipment, and computers, will be drawn from HIT® solar modules with industry-leading power output and supplied through rechargeable batteries manufactured by Panasonic. A total solar eclipse occurs when the moon crosses between the sun and Earth, therefore effectively concealing the whole body of the sun from view. 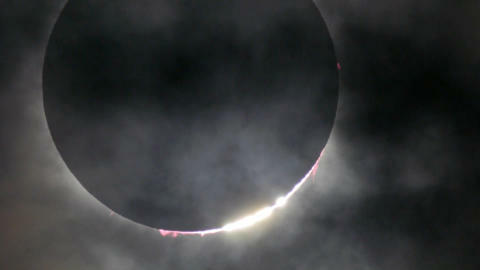 Since the total eclipse is a phenomenon in which the sun itself cannot be seen, it is the hot gases of the Corona, known as the "diamond ring effect" or the "prominence" that can be observed. 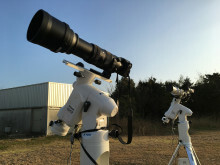 The viewing path from which someone is able to observe a total solar eclipse in its totality is very narrow, and therefore witnessing it is often described as an once-in-a-lifetime experience. 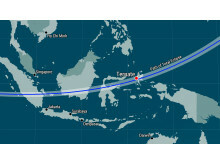 The total eclipse on March 9, 2016, starts over the Indian Ocean and will be visible from Sumatra, Borneo, and Sulawesi and from locations in the Pacific Ocean. A dramatic total eclipse will plunge the sun into darkness for 4 minutes and 9 seconds at maximum, creating an amazing spectacle for observers in a path up to 155 km wide. 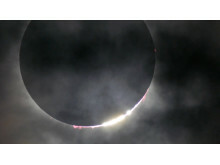 The partial eclipse will be visible in South-East Asia, and North and West Australia. 8 March 2016 – 9 March 2016 — Total Solar Eclipse. Time and Date. Retrieved from http://www.timeanddate.com/eclipse/solar/2016-march-9. Total Solar Eclipse of 9 Mar, 2016 AD. Hermit Eclipse. Retrieved from http://moonblink.info/Eclipse/eclipse/2016_03_09/data.